Think oysters on the half shell are too difficult to do at home? 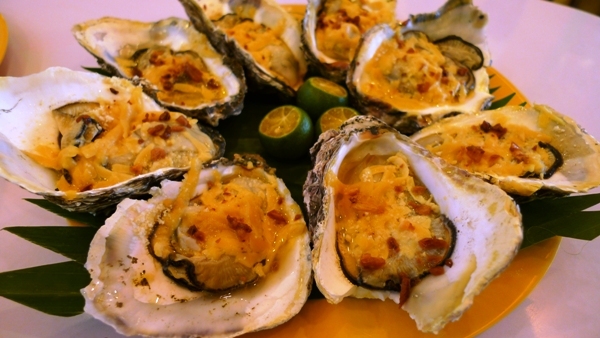 Not with this recipe, all you need is butter, cheddar cheese and oysters to make a great appetizer. 1. Fry bacon till crispy and slice to small pieces. 2. Saute garlic, onions, bacon, spinach. 3. Add worcestershre sauce and season with Ajinomoto Umami Super Seasoning. 4. Pour Spinach mixture on top of all oysters on baking tray and top with grated cheese. 5. Bake in preheated oven at 350F for 5 minutes and serve in plate with rock salt.